Bea lives a simple life residing in a SW London second-hand bookshop. It had been an especially difficult year, first with Bea’s uncle dying, and then splitting up with Brandon, her philandering, druggie boyfriend. The trivial daily conversations, local faces, and ordinary calm of the shop were all she desired, but that was all about to change. No-one expects to bump into supernatural beings, let alone two opposing sects of a forgotten race. Bea’s quiet existence turns into turmoil as she slowly starts to unravel a secret past. A lost history in which love, revenge, betrayal, magic, power and karma are not mere cycles of a soul, but a sacred journey upon a web of many possibilities. The future is not set in stone, and the choices that Bea makes ripple through the cosmos. As the secret unfolds, she realises that no matter what form your soul takes there are consequences for your actions, where time has no relevance. We call it karma, they call it Vororbla. Will she cope with the heartbreak and truths revealed before her? What would you do if your very existence came into question? 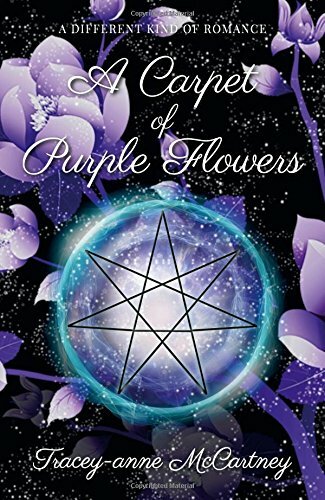 Join Bea on her journey as she uncovers the truth of her past via A Carpet of Purple Flowers. Epic fantasy, coming-of-age, romantic drama and mythology: this book is a finely woven carpet of great fiction. From the blurb, I expected a kind of ‘Twilight for adults’. What I got was intricately-imagined fantasy, suspenseful action, two beautifully interwoven love stories (not the kind of paranormal love triangle I was anticipating), and a lot of well-crafted drama. Brilliant – I want more!